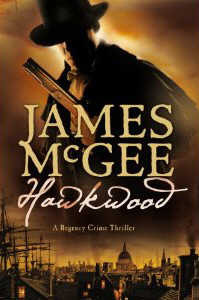 Hawkwood is the name of James McGee’s regency hero, a Bow Street Runner with a chequered history in an era when Britain is at war with Napoleon. A serving officer in the 95th Rifles, he was cashiered after he killed a fellow officer in a duel. With Wellington's intervention he was spared a court-martial, and instead joined the Spanish Guerrilleros, liaising with the British intelligence officer Colquhoun Grant. It is Grant's influence that enables Hawkwood to get a job at Bow Street on his return to England. The story opens with the highway robbery of a coach, where a Navy Lieutenant is killed and the diplomatic pouch he is carrying stolen. However this is not a random robbery and the papers in the pouch appear to be what the highwaymen were after. Magistrate James Read sends for Hawkood, who is to attend a party at the home of Lord Mandrake on a security assignment. During the evening, he comes to the rescue of a lady who is being harassed by three drunken young men. One of the men challenges Hawkwood to a duel, which Matthew is unable to walk away from and he injures the young nobleman. The lady, Catherine de Varesne, is very grateful for his help and the two embark on a brief affair during which she tells him her family were executed in ‘The Terror’ and she keeps her father’s stiletto beneath her pillow as protection against Napoleon’s spies. It isn’t until Hawkwood is ordered to investigate the disappearance of a fellow Runner, that pieces of a puzzle begin falling into place. The runner is found dead whilst on the trail of a disappeared clockmaker, and the papers found on the body are those stolen from the Navy Lieutenant. These papers are plans for a submersible boat, which the navy are eager to find as they believe it is being used in an attack on a new warship which is going to be visited by the Prince of Wales. Hawkwood is a great hero, honourable, wrongly accused and unable to resist a fight, but he’s also enigmatic and not averse to the charms of a dubious woman. I liked him. This story is a man’s book, I felt, as it gets very involved with the technicalities of building a submersible, but the style is engaging and the author gives us an excellent flavour of 18th century London dockyards in all its tacky, disgusting glory. His characters are well drawn and this story definitely makes me want to read Mr McGee’s other Hawkwood novels.